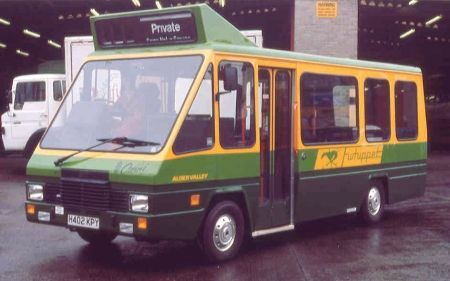 Whippet was the marketing name for a network of minibus routes run by the newly privatised Alder Valley South, between 1986-1992. Its aim was to attract passengers back to buses after years of poor service and decline by the National operator. Low cost mini buses were used on a high frequency with low fares and friendly cheerful drivers in order to do this. It is very appropriate that I have been asked to write this piece on the Whippets as I drove the very first Alder Valley Whippet. On Tuesday 26th August 1986 (Monday was a Bank Holiday) I drove the 0700 journey from Aldershot Wellington Centre to North Town on route 16 as it was called in Ford Transit 348 (C348 RPE). There were more company officials braving the weather on this cold and wet morning than paying passengers on board. In the next three months I was to do 615 journeys on this route. The 16 had a 10 minute headway until the 1821 from North Town and was operated on a hail and ride basis in the North Town area. There were 41 of the 16 seat Carlisle bodied Transits (310-50) delivered between March and May 1986 of which 23 were with AV South. On the 27th October 1986 the Whippet network was extended with four more services added, one in Camberley two in Farnborough and one in Woking. Eight more minibuses were delivered at the end of 1986 these being larger than the Fords, 21 seat Fiat/Iveco's with Robin Hood bodies. All were allocated to Woking with two being painted in Network South East livery for special commuter services. They were 469-76 (D469-76 WPM). The 1987 intake of Whippets was even larger, 22 seat Northern Counties bodied Dodges 410-10 (E401-10 EPE) and then 477- 80 (E201-4 EPB) which were Fiat/Iveco's with Robin Hood 25 seat bodies and these were followed by 411-20 (E411-20 EPE).The last two batches being fitted with automatic transmission. The Farnborough network of routes linked Farnborough Town Centre with local housing estates and Frimley Park Hospital. At its heyday there was a two and a half minute service along Fernhill Road. The Camberley network linked the Town Centre with local housing estates and also Frimley Park Hospital. More vehicles were added in 1988, 10 Fiat/Iveco's with Carlisle bodies 482-91 (F692-701 OPA) delivered in November and three more the next year 494-96 (G864-6 BPD). Also at this time the Transits were starting to be withdrawn with 10 of them going. The last new vehicle to be delivered in Whippet livery was in 1990 when 502 (H402 KPY) arrived. It was a very unusual vehicle, a CVE Omni with 23 seats and low floor easy access. In 1992 when Stagecoach took over Alder Valley it was transferred to Chichester where similar vehicles already operated. During the early days of Whippet operation there was a shortage of vehicles, so batch of Leyland Sherpas was hired in from Ribble and a Dodge from Cleveland Transit. On 27th October 1986 Alder Valley North, known as The Bee Line started their mini bus network marketed as Busy Bee with 16 of the first batch of Carlisle bodied Transits and six 20 seat Mercedes Benz mini buses operating in Bracknell, Maidenhead and Wokingham, but that's another story and someone else can tell it !